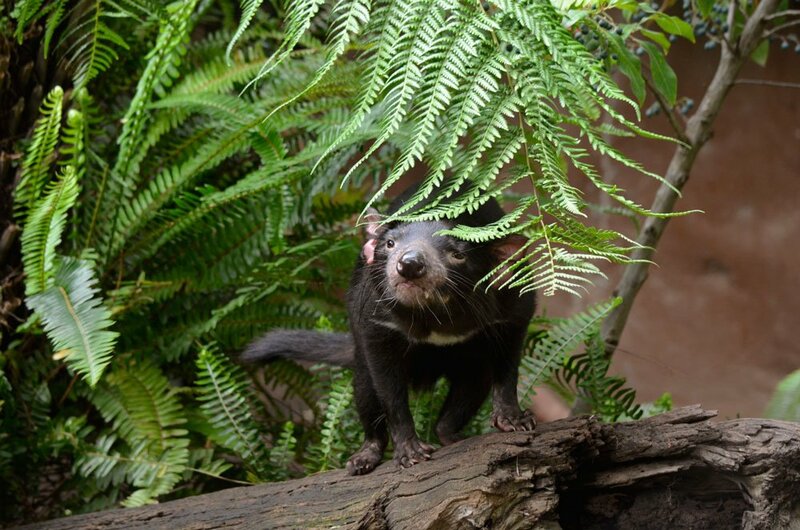 The decline of Tasmania’s top predator, the Tasmanian devil, in the wild is already causing a shift in the state’s ecosystem, scientists have found. Devil numbers are plummeting as the animals succumb to a facial tumour disease. Life for a possum in Tasmania used to mean venturing down from a tree to look for food and brought the risk of getting eaten by a Tasmanian devil. But with fewer devils in the landscape the possums are becoming more adventurous. University of Tasmania Zoologist Tracey Hollings said an experiment using sultanas as bait found the possums were spending more and more time on the ground gathering food. “The predation risk that they feel is much lower so [there is] much less vigilance,” she said. Her University of Tasmania colleague, Associate Professor Menna Jones, said some of the possums they studied were living as though devils did not even exist anymore. She said in eastern Tasmania, where more than 90 per cent of devils have been wiped out by the facial cancer disease, the possums were fearless. “Their behaviour, in the extent to which that they’re coming out in open on the ground away from the cover of trees, is very similar now to what we find on offshore islands where there are no devils, this means that devils are functionally extinct as far as possums are concerned,” she said. The researches said possums would eat more native vegetation like seedlings with no devils to chase them away, and possums would be more likely to interact with humans by eating gardens and farming pasture land. The possums’ risk-taking behaviour was also being treated like a canary in a coalmine. Associate Professor Jones said without devils operating as top predator the whole ecosystem was likely to change. “The loss of the devil out of the ecosystem can have ramifications for other species and could result in the decline and extinction of other species and changes in behaviour to the whole ecosystem, including vegetation,” she said. Associate Professor Jones anticipated that without devils the numbers of feral cats would increase and she warned that would put pressure on native mice and spread disease. “It could also result in an increase in the prevalence of [the parasite] toxoplasma gondii in the environment, which of course is a great concern to wildlife because animals like pademelons and bandicoots are susceptible to toxoplasmosis, as are sheep,” she said. She said the solution was to get devils back into the Tasmanian landscape. The State Government is working on a program of reintroducing devils into the wild by putting the animals in fenced-off areas.